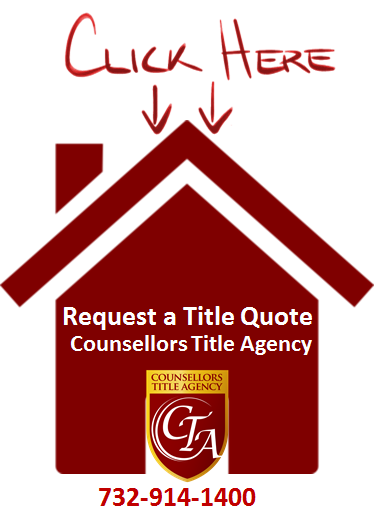 Since 1996, Counsellors Title Agency [CTA] has been providing swift, proven and knowledgeable title insurance settlement and search expertise for thousands of New Jersey’s attorneys, loan officers, Realtors, borrowers and purchasers. CTA’s detail-oriented team of professionals streamlines the complexities of a real estate transaction to make each one stress and glitch-free. 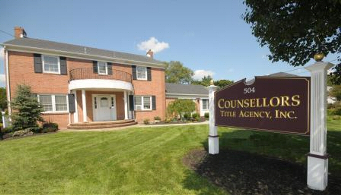 Counsellors Title Agency provides online title insurance for New Jersey’s attorneys, loan officers, Realtors, borrowers and purchasers. Click below in order to order a request for title. Sales: Leading NJ title insurance agency seeks experienced licensed salespersons to help expand its market share throughout the entire state. Benefits include health insurance, 401k with an employer match, flexible spending account, expense account, & marketing support. 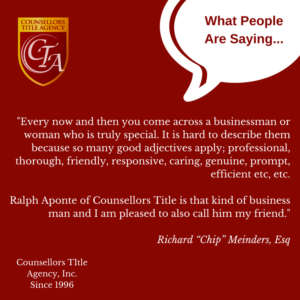 Send resumes by fax: 732-914-8898 or ralph@counsellorstitle.com.